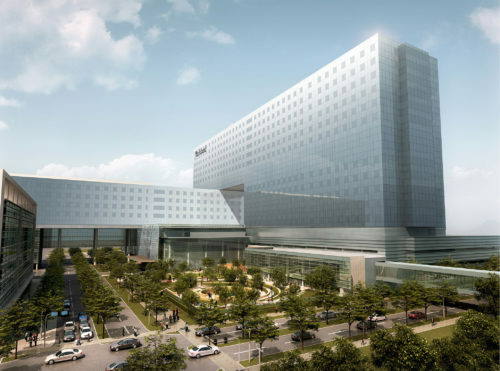 Parkland has selected the firms to design new hospital campus. Parkland Health & Hospital System has selected the firms charged with design and construction of a new hospital campus. The architect, a contract worth $44 million, is the joint venture HDR + Corgan. The construction manager, a contract worth $46 million, is the joint venture BARA, comprised of Balfour Beatty Construction, Austin Commercial, H.J. Russell & Company and Azteca Enterprises. The program controls manager, a contract worth $7.2 million, is CH2M HILL Enterprise Management Solutions and team. “These teams were chosen because they understand the importance of building a first-class hospital while remaining fiscally prudent and addressing Parkland’s unique needs, such as patient volume, our educational mission and first and foremost our desire to be a patient and family-centered hospital system,” said John Haupert, executive vice president and chief operating officer. “We believe that teaming our major project professionals from the start will deliver intelligent and practical design, which will yield construction time and dollar efficiencies,” said Lauren McDonald, M.D., chair, Parkland Board of Managers. The $1.27 billion project includes an 862-bed hospital, outpatient center, office center and parking. In order to reduce the burden on taxpayers, the financing plan includes not only $747 million of combination tax and revenue bonds, but also $350 million from Parkland’s current and future cash reserves and $150 million in philanthropic dollars raised by the Parkland Foundation. The construction program is planning to break ground in 2010. “Through this building program we are investing dollars back into the community and creating new jobs. This yields long-term dividends for not only Parkland but for everyone. That’s why a new hospital is important to us all,” Dr. McDonald said. Philanthropic support is a key factor in funding the new hospital campus. With one of the most active fundraising programs in the country, Parkland Foundation has already secured $83 million from generous benefactors throughout the region for the building program. "The overwhelming support from the community, even in a difficult economy, has been a refreshing response that we hope others will join. With the community’s support, our journey to redefine public health care will allow us to become a hospital of choice,” said Ron J. Anderson, M.D., Parkland president and chief executive officer.